So today is day 1 and the first one that I'll present is Lucy Hale. She plays Aria Montgomery on the show - an artistic, independent girl whose family moved back to Rosewood after her father took a three year sabbatical in Iceland. Prior to Alison's disappearance, Aria became aware that her father was having an affair with a student of his (Meredith); having promised to keep it a secret, she is kicked out of the house after the first "A" reveals the affair to her mother. Her parents divorce and Aria's father marries Meredith, and she becomes pregnant. Aria often feels out of place in Rosewood and tends to be attracted to older, more worldly men, which frequently causes conflicts for her. After a near-death experience, she is overcome with guilt and decides to confess to accidentally killing Tabitha (unaware she was not responsible for Tabitha's death). She has more of an edgy style than the rest of the girls. I personally like it most of the times, because she mix and matches different styles as many of young girls do it right now, so for that reason she is one of the most relatable characters on the show. I found some outfits that I just loved seeing on her and decided to make on on Polyvore based on her original style. 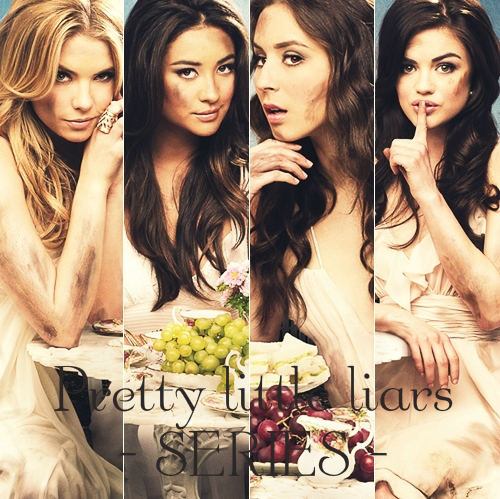 And you, do you like Pretty little liars? What do you think about Aria?